If you know this site, you know I get a special CafePress promo code pretty much every weekend, and pretty much every weekend I let you know about it. This weekend's code is HIGH75, which allows you to take up to 75% OFF already discounted items throughout the store. If you don't know CafePress, they are "where the world shops for custom t-shirts and other unique gifts that express people's unique personalities." I am actually going to put my picture on an iPhone case and give it to my girlfriend as a present. Then, when she's talking on the thing, the world will know how crazy she is about me. It's the thought that counts. 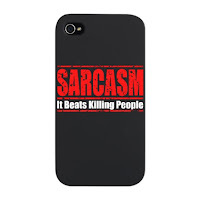 Click here to go to CafePress and to shop. Don't forget to add code HIGH75 to get the discount.